This project composed the outlet structures which receives water from the new East End Inlet and Pump Station on Devils Lake. Water is pumped via a 96” pipeline to the new outlet structure for control release into the Tolna Coulee. At the outlet structure, an initial stage is used to dissipate the pipeline flow and distribute water to a rock filtering system to remove biologically undesirable fish and other contaminants. From the filter, the water is transferred to the terminal structure which spreads the water across a stilling basin structure for final release. Work was started in December of 2011 and continued through the winter in order to meet July completion deadlines. 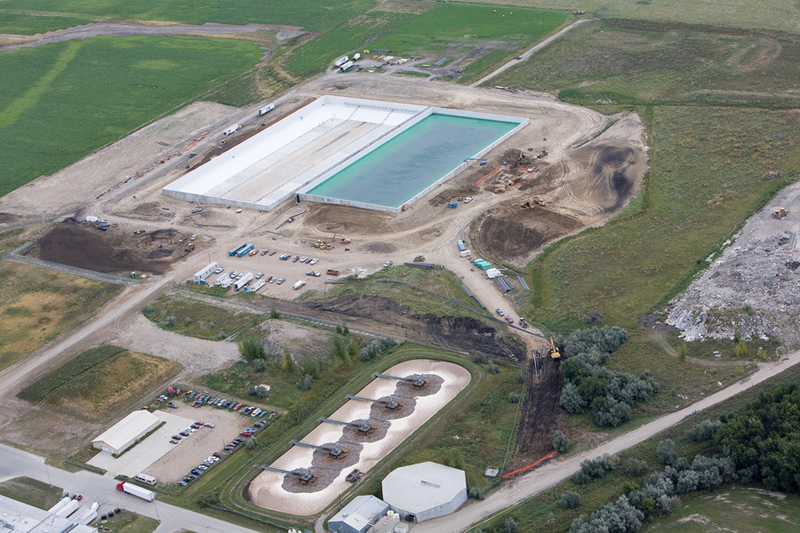 With pressure to establish increased capacity for water removal from Devils Lake, the project requirements included an extremely large liquidated damages clause for completion delays. 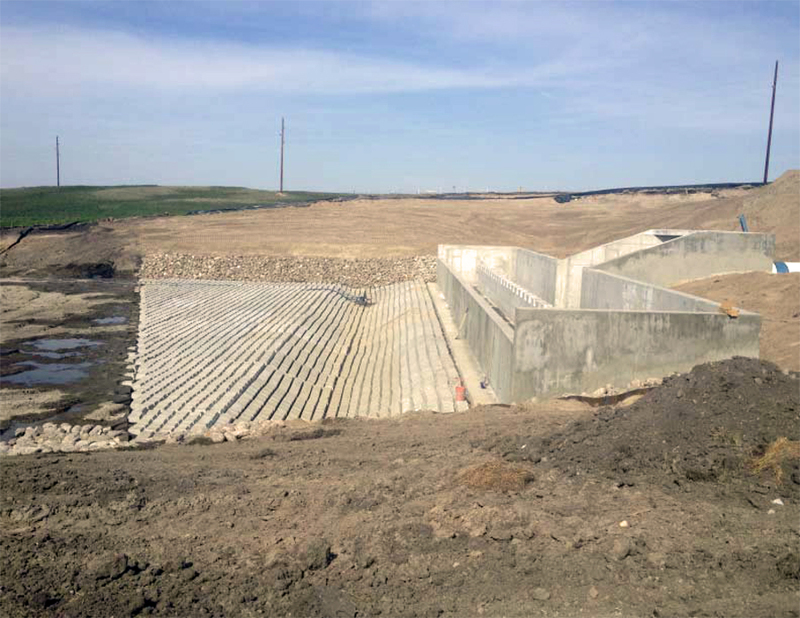 Additional concrete was used in the outflow area, where grouted concrete cable mats were used to provide core erosion control for the outlet into Tolna Coulee. With project completion ahead of schedule, pumping to reduce levels in the lake were started on time, providing anticipated relief from ongoing rising waters in Devils Lake. 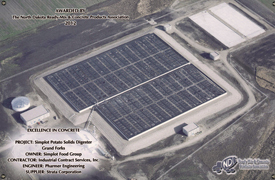 This project included construction of two 27,000,000 gallon concrete potato solids digester cells designed to reduce the amount of solid waste leaving the Simplot plant. A Design/Build contract also provided site piping, off site piping, a lift station and 6 buildings. One of the "green" benefits of the design provided for the collection of digester bio-gas, a flammable product useful for the firing of digester plant boilers. Through the effective bio-gas containment and collection process, Simplot will maximize promotion of this feature as part of its image to be an environmentally friendly company. Plus, the added capacity to pre-treat its industrial waste will provide growth potential for the Grand Forks industrial leader for decades to come. Engineering demands for the project were very challenging. Building on the soil conditions of the Red River Valley always require extreme attention to detail. The fatty clays are known to cause movement in structures. Due to this concern, great care was taken to engineer subbase and subsoil conditions for maximum stability. Working with Pharmer Engineering and ICS, Strata Corporation developed a high performance concrete mix allowing maximum workability while keeping shrinkage low. The mix incorporated shrinkage reducing admixtures (SRA), structural fibers, and high range water reducers (HRWR), all to ensure the lowest possible shrinkage at the lowest practical water to cement ratio. In the end, the specification for maximum shrinkage of 0.045% in accordance ASTM C1157 was met in every case. The construction phase of the project was also engineered to minimize the impact of the shrinkage of concrete. The critical area of the digester floor was carefully constructed in strict accordance with a checkerboard placement plan, ensuring a minimum of seven days of curing between adjacent floor plates. This allowed for the initial concrete shrinkage to occur prior to an adjacent concrete placement, thus reducing overall floor slab shrinkage and cracking potential. As a result of a great project team effort, the project was successfully constructed meeting or exceeding all engineering requirements. In all, over 18,000 c.y. of concrete and 2.48 million pounds of rebar were used to complete the project. 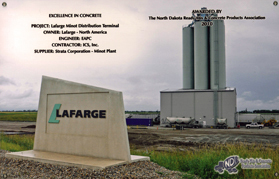 The Lafarge Minot Distribution Terminal was planned as a 200 ton per hour loading and unloading terminal for cement and fly ash from rail and truck cars. 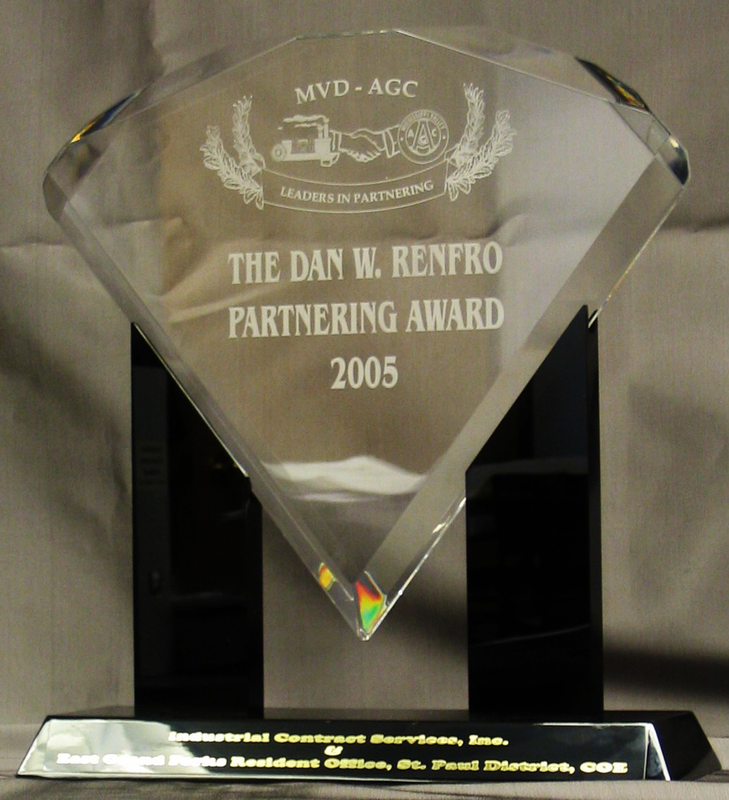 It went into service in September 2009 and has met or exceeded the design discharge goal. It features storage silos, pneumatic conveyors, (aka air slides), a high-capacity bucket elevator, rail and truck loading and unloading features, and unique concrete framing assemblies. There are ancillary office and support facilities within the terminal. The project was constructed with 5 silos, with provisions for a 6th silo to be installed at a later date. The signature feature of this project, and the basis for submitting the nomination, is the cast-in-place reinforced concrete moment frame that supports up to six 500 metric ton cement product storage silos. The cast in place silo support frame consisted of a 2x3 bay system that utilized 12 - 36" square columns, with 30"x36" or 36"x36" concrete beams. A total of 345 CY of concrete was used to construct the frame alone. Several options for the silo support structure were contemplated � steel moment frames, steel concentrically braced frames, and precast concrete and beam framing. Cast-in-place concrete was selected due to several of its relative benefits. It provided flexibility, quick and easy coordinated delivery schedules, optimization of contractors labor force, and the ability to work, even in cold weather. 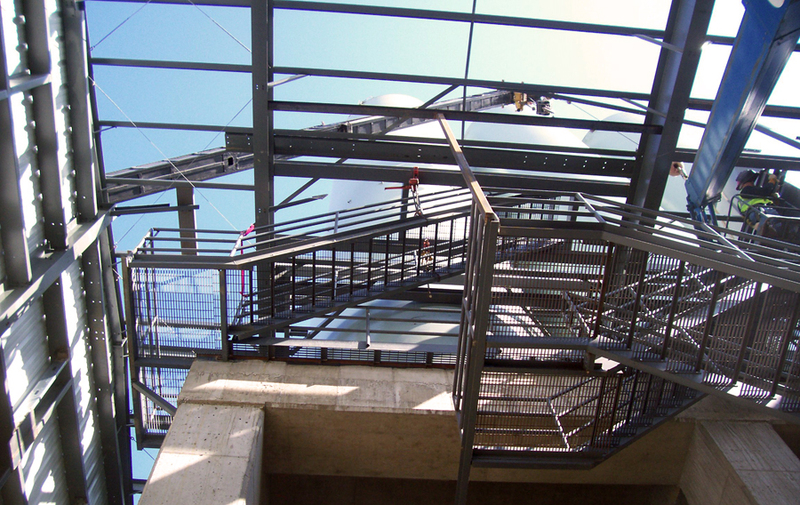 From an engineering perspective, concrete provided the ability to resist column torsion and bi-axial bending, high stiffness for a relatively compact shape, and ease in creating moment frame connections using traditional reinforcing steel. And, of course, Lafarge was interested in the use of materials supplied by their customers. The total volume of concrete used on the project was 1,400 CY. 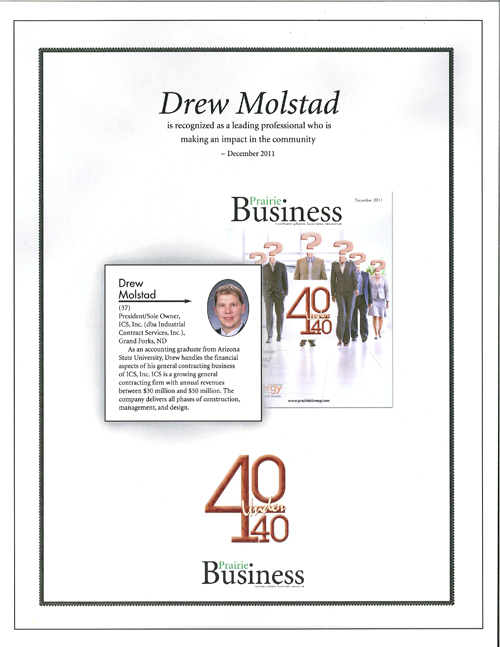 As an Accounting graduate from Arizona State University, Drew mainly handles the financial aspects of his general contracting business of ICS, Inc. ICS is a growing general contracting firm with annual revenues between 30 to 50 million. They deliver all phases of construction, management and design. 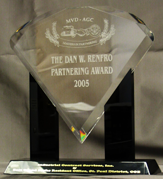 He is also a past president of the AGC of North Dakota and currently holds a seat on the board of directors of the AGC. 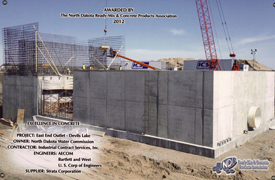 The Phase 2 project encompassed two distinct reaches in East Grand Forks, Minnesota, and a section in Grand Forks, North Dakota, and included the Business Highway 2 and Highway 2 levees; three railroad closures on the BNSF line in Grand Forks and East Grand Forks; protection of the City’s water treatment plant and water reservoir and construction of a floodwall in the residential area known locally as “the Point.” Throughout the project, work often took place at as many as four to six separate locations. The project was characterized by construction in residential areas, as well as along a major State Highway and in the City’s industrial area and in and around the City’s water treatment plant. Work included construction in geotechnically sensitive areas with concern for soil stabilization and the potential for slippage and slumping along the riverbank. Work included the stabilization and protection of the City’s 1,000,000 gallon water reservoir. The most challenging aspect of the project was construction of three railroad closures on the BNSF line through the cities of Grand Forks and East Grand Forks. Because of the importance of the line, BNSF would only permit an outage of 24-hours; from the removal of the track and ballast until the next freight train traveled across the newly constructed closures, the Contractor had just 14 hours. In this time, the Contractor was required to construct the three railroad closures simultaneously, and could not backfill the structures until the concrete had reached 70% of its design strength. The first item of construction initiated by the Contractor was the construction of the 2nd Ave NW road closure. The road closure is just north of the Louis Murray Bridge across the Red Lake River on the only route between the north and south ends of East Grand Forks, which required coordination with residents, the local school district and the police and fire department, since this was the only route for emergency vehicles. The project included the construction of a road raise on Business Highway 2, the primary route for trucks hauling beets to the American Crystal Sugar Plant in East Grand Forks. Originally, the Contractor intended to construct the road raise in September – October 2003, but revised their schedule upon request from American Crystal Sugar and the City representatives. Rather than disrupt the beet harvest detour the thousands of trucks hauling sugar beets to the plant, the Contractor opted to construct the road raise during the spring. Although this was a less opportune time for the Contractor, they chose to support the community’s largest privately owned business and the local farmers who rely on this harvest. After award of the project, the Corps’ archeologist received the Cultural Resources Investigation on the borrow site and discovered that contrary to the verbal reports received from the investigators, they had determined that the site designated for “select” impervious fill should be considered culturally significant. The only alternative site was located several miles away and would dramatically increase cost and time. The City, Corps, Contractor and local Catholic Church worked together to find a solution which limited the impact to the project. The soil in one of the abandoned riverside neighborhoods was tested and found to be acceptable. The Contractor borrowed the material, but left the streets in place. After removal of the material, the site was restored by the Catholic Church and now serves as athletic fields for the parochial school and the community as a whole. 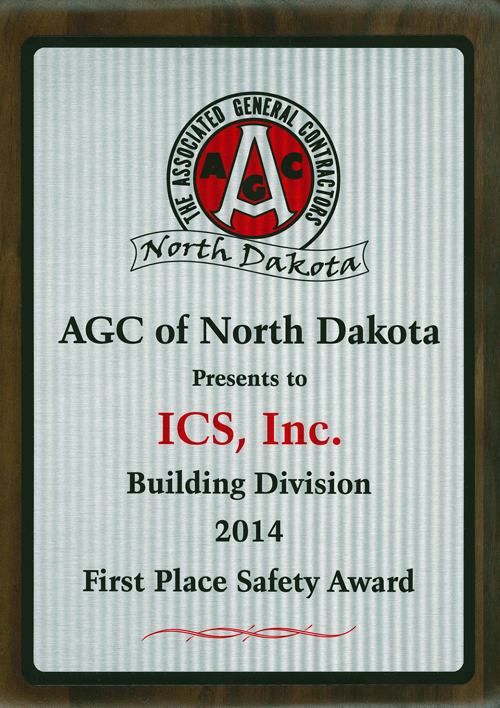 The Contractors and subcontractors on East Grand Forks Levees Phase 2 maintained an exceptional safety record. 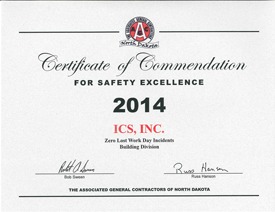 There were in excess of 67,326 manhours on the project with no recordable accidents and 0 frequency rate.